Located in the south-eastern part of the Kremnické pohorie mountains, 10 km to the south-west of Banská Bystrica, the area of primeval forest has been protected since 1913, thus being one of those natural reserves in Slovakia protected by law for a longest period of time. Its original area of 20.51 ha has been subsequently extended to the current 30.70 ha. 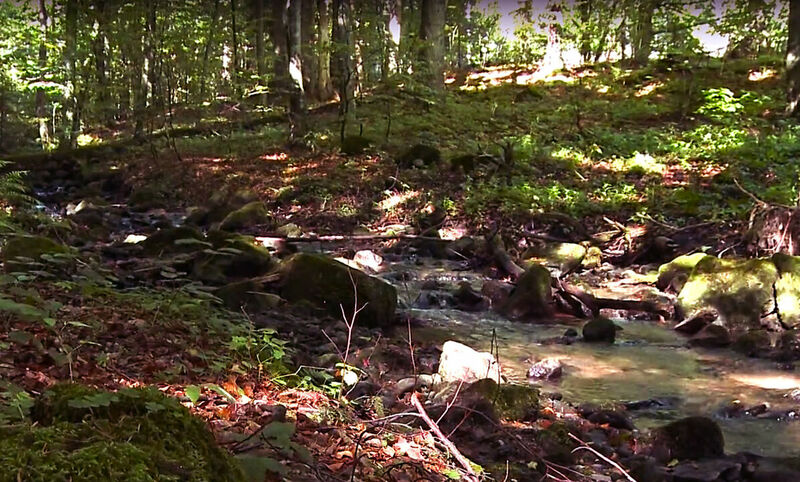 In 1994 the primeval forest received a national landscape reserve status as a remnant of original Carpathian woodland. The primary fir and beech forest, mixed with spruce, maple, ash and elm, is notable for huge silver firs (200 to 400 years old, the tallest being 46 m high and having the trunk perimeter of 553 cm) and European beeches (trunk perimeter of 496 cm). A walk in the shadow of these enormous trees makes an unforgettable experience as it provides a unique opportunity to enter an original aged forest untouched by human activity. European white elm (Ulmus laevis), that has become an endangered species, is plentiful here. Several young trees were taken to England even by Princ Charles himself. The primeval forest provides habitat for many protected species of both flora and fauna lynx (Lynx lynx), newt (Triturus montandoni), rosalia longicorn (Rosalia alpina), etc.). To secure the lowest possible human interference, only fallen trunks threatening the forest road operation are removed. The primeval forest of Badínsky prales has been completely closed to the public under the Nature and Landscape Conservation Act. It may only be accessed by expert excursions accompanied by a guide from the Lesy SR (Forests of the Slovak Republic) branch office in Slovenská Ľupča or by experts from the Štátna ochrana prírody SR (National Nature Conservation Authority) office, the Faculty of Forestry of the Technical University in Zvolen, or other scientific and research institutions. The pension is located in the beautiful Kremnicke pohorie in the center of Králiky recreation area at an altitude of 900m. n. m, 14 km northwest of Banska Bystrica. It enjoys the perfect holiday conditions throughout the year. Providing free WiFi, Penzión Olympia** offers accommodations in Banská Bystrica, 5.1 km from Central Slovakian Gallery and 14.5 km from Ski Sachticky. Featuring a 24-hour front desk, this property also provides guests with a restaurant. At the guesthouse, every room has a closet. A buffet breakfast is available daily at Penzión Olympia**. Offering a restaurant, Motel Madona is located in Banská Bystrica, 2 km from the historical city centre with its castle and 6.4 km from the Medvedica Ski Area. Free WiFi access is available. Adrenalinové centrum z množstvom leteckých zážitkou na celý život. The centre of the southern part of Turiec is the spa Turčianske Teplice. The local hot springs were first mentioned in the 13th century. The legend has that King Sigismund of Luxembourg bathed in local springs in 1423. The town of Kremnica acquired the land with springs in 1532 and invested in construction of the first spa buildings. The spa was especially popular and visited in time of wars with the Habsburgs when the noble rebels used it as a refuge. The Spa & Aquapark resort is in a beautiful aqua park, in the centre of Turčianske Teplice. It has two parts: ‘SPA‘ area (healing thermal water, 38 °C) and AQUAPARK area (thermal water up to 33 °C). Both are open throughout the year. Pozývame Vás na premietanie Pavla „Hiraxa“ Baričáka o jeho výstupe na Elbrus severnou stranou (99% Slovákov vychádza Elbrus z južnej, priveľa už komercionalizovanej strany) a jeho putovaní po Rusku (Moskva, Velikij Novgorod, Jarosľav, Volgograd, Piatigorsk, Kislovodsk...). Autor úspešných cestopisov z Nepálu, Etiópie, Ekvádoru, Indonézie, Panamy, Kostariky a Nového Zélandu počas svojho premietania a rozprávania pokrstí aj svoj čerstvý cestopis a to práve z jeho ruskej cesty. "Jedni na Rusko nadávajú, iní ho zbožňujú. Musel som sa do tejto krajiny vybrať osobne, aby som sa jej bytostne dotkol a spravil si na ňu vlastný názor," vyslovil sa Hirax. V prípade záujmu, po prednáške je možnosť dať si podpísať prinesené knihy, či kúpiť si tituly priamo na mieste od autora. Hiraxove cestopisy, romány, básne a iné nájdete - tu: http://hladohlas.sk Vstupné predpredaj: 5€ Predpredaj.sk vám umožňuje online nákup vstupeniek na rôzne hudobné, kultúrne, športové a iné podujatia. Môže mať manželstvo „voľné pravidlá“? A dokážu ich vôbec akceptovať obe strany? Je to len otázka prispôsobenia sa a nájdenia si vlastného receptu na šťastie. Dlhoročný manželský pár hľadá oživenie stratenej vášne – manžel je nenapraviteľný sukničkár, ktorý však za nič na svete nechce odísť od svojej ženy a submisívna manželka je ochotná akceptovať všetko, len aby neostala sama.